Fitting soundproofing is less difficult than you may think, and if the instructions are followed then any non specialist can fit our materials. Many customers will choose the DIY route. However if you really have no DIY skills, or time, we would suggest using the following two recommended websites: checkatrade.com and ratedpeople.com. Remember for customers in the London area we have an approved fitter, Soundproofing UK who can be reached on 0794 383 3022. The website has a longer questionnaire aimed at matching you up with a fitter. We suggest you follow the model answers provided at the bottom of this page. Both sites will introduce you to trusted local tradesmen who can give free quotations. We would advise you to get a minimum of three quotes. Any recommended trades person should be happy to come to your property to give you a free quote. We are happy to chat to builders if they feel unsure about any aspect of the job. Don’t necessarily go with the first builder, but the one who you feel most comfortable with. Checkatrade and Rated People have a fairly strong standards policy. There a lot of good, competent and highly recommended builders out there! Many builders , however experienced , may not have soundproofed a property before. They might be unfamiliar with some of the component parts. It is important that anyone quoting doesn't try to offer an alternative system, cut corners,or feel that some components we provide are not necessary. All the systems we offer are straightforward to fit and are effective if the instructions are followed. When things are left out the soundproofing will be less effective. 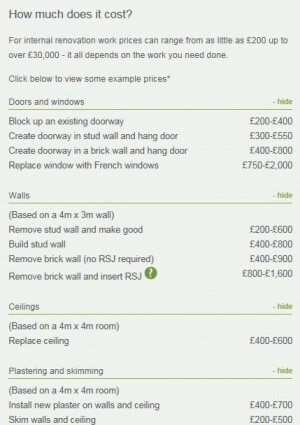 Builders should be comfortable with your instructions as the client and with our web site instructions. How long should the job take and how much should it cost? This is a very tricky question. As every house is unique and can bring different problems. On the right is a rough guide provided by rated people for standard building work. In general many of our soundproofing jobs are straightforward often with just specialist materials which are not tricky for a builder to install. Obviously the size of the job will affect the price and different on site issues will affect pricing but at least you will have a ball park figure. Remember getting thee quotes will let you assess if the price feels right. Floors can be time consuming if raising old floor boards and in filling with mineral wool. Again a bedroom floor, two people two to three days. Simple things like adding Tecsound and Isosonic mats can be a one man job completed in a day. Soundstop panels – A bedroom wall can be done in a day by two. An SS20 wall two days tops. Other solutions involving stud walls can be a bit more time consuming.